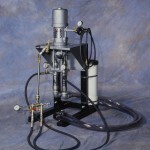 ARNCO Graco Flushless II Pump II Pumping System is our most popular unit for sale or rental to the tyre industry, equipment suppliers or on-site remote locations. The ultimate for the fast, effective and clean installation of ARNCO flatroofing materials. Minimizes waste, is easy to maintain, and simple to learn how to operate. At up to 35lbs. per minute, it is the only pumping system in the industry that uses only genuine Graco components as well as Arnco’s Smart Guage™ and Quickfill Connector™.